There is really no question as to who the Smashing Pumpkins are. Loyal but long disaffected and disappointed fans that argue that the proto-Aughts version of the band) the one that included the “original” line up of James Iha, D’arcy, and Jimmy Chamberlin) is the only real Smashing Pumpkins and that anything other than that iteration can’t be taken seriously, are delusional. The Smashing Pumpkins is Billy Corgan. This has always been the case, and those fans know it. The real problem is that it’s often difficult to age with our favorite bands. When you’re between 15 and 17 like I was when Siamese Dream and Mellon Collie & the Infinite Sadness came out, Billy Corgan’s tendency to rant and whine was what endeared me to him. I too was a ranter and a whiner. Young fans interpreted Billy’s behavior and public persona as bitter but beautiful honesty — a tap into the source, and Billy a messenger who helped make sense of the injustices of adolescence. Yes, Corgan was our heralding angel. It didn’t hurt then that he wrote about fifty songs in the first half of the 90s that were truly incredible a handful of which might even be called masterpieces. Now Billy’s rants – in fault-finding and finger-pointing interviews about the history of the band and especially on his twitter feed — no longer pack the same visceral punch. Now, our kids whine, not our rock stars. Unfortunately, neither his original band mates (all of whom have now fled the coop) nor his recent releases have been enough to distract us away from that personality. And while I liked 2003’s Zwan project more than 2000’s Machina, his solo record (2005) and not-so-triumphant reunion debacle Zeitgeist (2007) have given me the courage to move on. But that doesn’t mean I don’t perk up when I hear about new releases. When I first heard about the 44-song project Corgan is currently working on, I was skeptical. 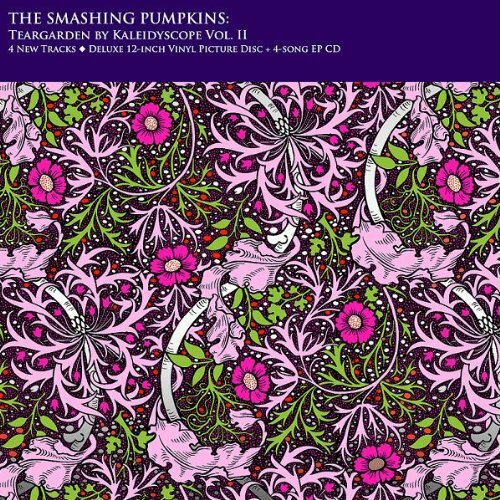 But, it appears to be a serious endeavor: The Smashing Pumpkins are releasing 44 songs for free on through their website and calling the collection Teargarden y Kaleidyscope. Every four songs, they package the tunes and put them out as a special EP. And here’s the thing: The songs are not half bad. In fact, many of them are good. The most current release, Vol. 2 – The Solstice Bare comes out today and not a single one of the four tracks is overwrought. The songs are not mind blowing, but for once, Billy doesn’t seem like he is trying to prove his relevance to both old and new fans on every track. Respect is given to the song, rather than just the hook – quite an accomplishment from one of the most prolific and talented of hook writers. The new songs are not without their quirks. If you listen carefully you’ll hear a bit of Corgan’s current pseudo-spiritualist politics poking through (the single “Freak” is probably the best example here). But the others, songs like the EP’s closing track “Spangled,” are both singable and sincere and remind me of some of the best B-side tracks from Mellon Collie. The Smashing Pumpkins are no longer my favorite band. But with the first two EPs from the Teargarden project comes music that makes me want to dig up my old CDs and reminisce – a far cry from trying to pretend I never loved them, which is where I was headed. I wonder if Billy can keep it up for 36 more tracks.